MONTGOMERY, AL – Montgomery posted a season-high in runs and margin of victory, and Jeremy Hall tossed seven scoreless to tie a Biscuits record with 30 consecutive scoreless innings in an 11-2 Biscuits (32-24) romp over the Jacksonville Suns (34-23) Monday at Riverwalk. With the win, the Biscuits move to a season-best eight games over .500 and now sit only 1.5 games behind the Suns with 12 remaining. Hall (4-2) has now won four consecutive outings, going seven, eight, eight, and seven scoreless to tie Brian Baker’s 2009 record. 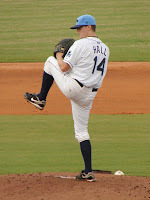 Hall will attempt to set a new one when he takes the mound against Birmingham – the last team he allowed a run against – on Saturday. The Biscuits got an RBI single from Rashad Eldridge in the first inning, and an RBI bounce out from Nevin Ashley to make it 2-0. A two-out error allowed the third run of the frame to score. The Biscuits would add one more an inning later on an Emeel Salem base hit to balloon the lead to 4-0. Cody Cipriano scored John Matulia with a single in the sixth, then the Biscuits used a sac fly from Cipriano and a single from Chris De La Cruz in combination with two more Jacksonville errors to make it 9-0 in the seventh. Ashley smacked his first homer of the season in the eighth to finish the Biscuits scoring. The Suns scored single runs in the eighth and in the ninth. Eldride, Matulia, Cipriano, and De La Cruz all recorded two hits to lead the Biscuits. Ashley drove in three, with Cipriano and Salem each knocking home two. Andrew Miller (0-3) started for the Suns and allowed four runs on four hits and five walks in five innings. LHP Jake McGee will throw for the Biscuits in game four of the series on Tuesday against Jacksonville RHP Alex Sanabia at 7:05.